184 pages | 5 B/W Illus. What makes for strong and enduring relationships? It is a question of increasing scientific and popular interest as it has become clear that relationships can make life happier, healthier, and longer. In this collection, the reader will find an overview of state-of-the-art research on this question and a glimpse of the new directions that will define the future of this field of study. With contributions from leading scholars in the field, the book offers cutting-edge perspectives on the factors and processes that contribute to strong, thriving, and resilient close relationships. Split into three parts, the first part discusses important factors and processes contributing to strong relational bonds in the form of different types of relationships. The second part spotlights contexts such as culture and gender as the domain for future advances in this area of research. Finally, the last part covers data analytic techniques and future directions. Offering a unique perspective on each topic covered, the authors highlight the promising next steps which will inspire advances in the field in the years to come. 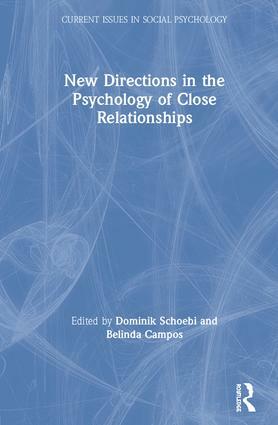 Bringing together important trends from different areas of research, this text will make a significant contribution to social psychology and is essential for students and academics interested in the psychology of relationships. Dominik Schoebi is Professor of Clinical and Health Psychology at the University of Fribourg, Switzerland. His research centers on daily interactions and emotion processes in intimate and family relationships, and their implications for relationship functioning, as well as for mental and physical health. Belinda Campos is an Associate Professor in the Department of Chicano/Latino Studies at the University of California, USA. Her research examines the role of culture in shaping relationship experience and health. Her current research projects investigate the ways in which culture and positive emotions shape health outcomes, with a focus on U.S. Latinos. Current Issues in Social Psychology is a series of edited books that reflect the state of current and emerging topics of interest in social psychology. Each volume makes a conceptual contribution to the topic by reviewing or synthesizing the existing research literature, by advancing theory in the area, or by some combination of these missions. The books are tightly focused on a particular topic and consists of seven to ten chapters contributed by international experts. The editors of individual volumes are leading figures in their areas and provide an introductory overview. The series is useful reading for students, academics, and researchers of social psychology and related disciplines. Example topics include: self-esteem, mindfulness, evolutionary social psychology, minority groups, social neuroscience, cyberbullying and social stigma.